Here is my third commercial use pack that I've made for Halloween. It is perfect for your projects for Halloween. There are 6 PSD templates all sized for either tagger or full-size scrapbooking. They are fully customizable. Let your imagination play! I included 6 PNG examples (as shown in preview) that you can use too! 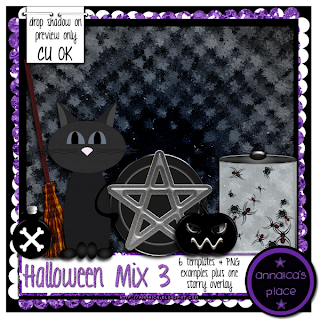 There is a potion bottle, a broom, a cat, a pentagram, a pumpkin and a jar of spiders! There is also one stary overlay and the example I've made with it :) You can get this pack, and all my other creations in stores where I sell at! Just wanted to briefly mention that I got over 100 downloads on my CU Chrome Butterfly with only 3 comments. I would think if you can take the time to download my goodies that you can also take the time to say thanks. I give the freebies because I know what it is like to need something and can't afford it... I want you all to be able to enjoy my creations and not spend a fortune. So please just let me know you appreciate what I leave here for you. It really means alot to me. Thank you so much to everybody who leaves me a comment! So here's another freebie. It's CU OK. Click on the preview to download, read and follow the TOU and direct others here to my blog post to download. Thank you so much for this post. I want to let you know that I posted a link to your blog in CBH Digital Scrapbooking Freebies (please, notice the new url for my blog), under the Page 1 post on Sep. 07, 2012. Thanks again.